Congo won today. I put in a good effort, but I came out on the losing end. On occasion I do win, but, frankly, not that often. Today, my final defeat and concession to the Congo came as I stubbed my toe on the doorstop in our pantry. It’s a heavy, metal doorstop, shaped like a seal, that is necessary because otherwise the door closes and you are trapped, usually carrying something heavy, with no way to open the door from the inside. The doorstop incident was really just a small battle in my overall day, but it is where I mentally lost the war. My epic battle today came at the grocery store. Although Shoprite has, on many occasions, been my savior from boredom, today it picked me up and slapped me silly with Congo-ness. We are having people over for dinner and, like I normally do, I had a general menu plan in mind: roast pork with rosemary and garlic rub, scalloped potatoes and glazed carrots. Seems simple enough right? I’d already discarded dozens of potential recipes because I knew – 100% – that I would not be able to find (or, if found, afford) the necessary ingredients. So I went happily to Shoprite expecting to be able to find the pretty basic things I needed. I started in the produce section because that is the first place I walk past. Rosemary? Nope. Ok, next plan. I opened Google on my phone and found a new recipe: Pork with sage and greens. Ok. Sage? Hmmm…well, there was one packet of sage, but it was kind of brown and mouldy. However, since it looked like maybe I could salvage a couple of leaves I went for it. Next stop: greens. There were probably a dozen or more bags of baby spinach, but they were all horrifying in their level of decay. I could feel the tears starting to rise as I rifled through the bags and determined there wasn’t a single one that I could serve to guests – even cooked. Ok. Fine. What else was there? Broccoli? Nope, brown and $15/head. Since I was serving 8 people I needed more than I was willing to buy given its appearance. Cauliflower? Nope, brown and $12/head. Asparagus? $12 for about 10 spears. Nope. Cabbage? It looked better than anything else, so cabbage got the nod. Then I moved on to the pork… I had to walk along the meat aisle and so it gave me a chance to assess my other options. Goat? Not so much. Pork belly? Normally, not a bad choice, but it’s not a “quick” dinner options and beside there was only about a pound of it, not enough for 8 people. Lamb parts (unidentified, but no parts I am familiar with)? Uh…negative. Steak? It’s good stuff, but I wasn’t up for lugging out the grill, breaking up charcoal and getting it going. So I arrived at the place where the pork tenderloin and roast is normally kept and found three pitiful ¼ lb tenderloins displaying suspicious black marks, and no roast. I just stood there and stared for a while. Cursing myself for believing I could pull off a last minute dinner here, and cursing B for suggesting we expand the group beyond the one person I had originally invited (and conveniently forgetting my happy agreement to this plan), I sidled along to the butcher counter to see if there were better options. There I found chicken gizzards (YUM, right? ), ground beef and chicken breasts – one of which had a dead fly in the middle of it. Seriously. I went with the chicken breast – minus the dead fly (I carefully instructed the woman at the counter which pieces I wanted, thereby avoiding the dead fly piece even though she had, by then, removed the fly). After all that, when I returned home and stubbed my toe I lost it for a little while, screaming my frustration to Miller and the empty house. Sometimes around here that really is the only option. But, as it turns out the party was actually very nice. We pulled out a good bottle of wine we had brought back from Cape Town, and the homemade ice cream I made yesterday. I made a cream leek sauce to go on the chicken and I sautéed the cabbage and carrots in butter (a fool proof option even in the Congo) and I made the scalloped potatoes as planned. The company was wonderful, we all had a great time, and the wine and dessert were delish. So, as it turns out, maybe Congo didn’t win today after all. Sunset over the Congo River…waiting for another day. The dry season is in full swing in Congo right now, which means cool nights and not-too-humid days. It’s been bizarre seeing people talking about the sweltering heat in the US and Canada right now while we (or at least I) need sweaters to sit out at night. Dry season also means making plans with a 100% guarantee that it will not rain on our parade, or party, or whatever. So we, along with some friends, decided that this was the perfect time to take our first stab at camping – Congo style. I grew up camping several times per summer, but once I got out of college I could probably count my camping trips on one hand. I’ve missed it. The smell of wood smoke in your clothes, the taste of almost burned marshmallows, waking up to birds calling and a layer of dew coating the world. But B has never known me as a camper, and I don’t think he really believe me when I have said on occasion over the last ten years that I wanted to go camping. You can’t blame him, really. I’m a shopping and pedicure kind of girl most of the time. Case in point, I took C this morning to get her hair cut and we had our first (of many I hope) mommy-daughter pedicures. But I’ve never found it that difficult to juggle being a girl who likes pedicures AND getting dirty on a camping trip, so for ten years I have insisted to B that I really do like – and want to go – camping. It wasn’t until other adventurous friends of ours (the same ones who joined us on the train adventure) suggested camping at a national park outside Kinshasa that B was apparently willing to test out my assurances. One of the worst parts of traveling anywhere to do anything around DRC is that the roads are abysmal. Think of the worst road you have ever been on in the US and then multiply that times at least 50 – and then put it right in the middle of the capital city of the country. I’ve posted pictures of the roads before, but they bear reposting to emphasize my point. The picture above is the road between two U.S. Embassy compounds. Seriously. BUT, the road between our house and Bombo-Lemene, our camping destination, was PAVED. All. The. Way. Like a miracle from above. Seriously. It still took us about 2 hours to get from home to the park, but in DRC to drive 105 km in 2 hours is nothing short of amazing. By way of comparison, Zongo Falls, where we went last Labor Day, is 101 km from home and that took us about 4 1/2 hours to drive in whiplash inducing conditions. Don’t get me wrong, there were still a lot of very interesting sights on the drive, but at least we could look at them without risking injury. When we arrived at the park we drove down a long two-track path to get down to the river. I’m not sure which river – either the Bombo, or the Lemene, since the park is named for the confluence of the two, but whichever one it was we enjoyed tubing down it (B), playing in it (C) and dipping toes gingerly at the edges of its cold depths (me). The bridge over the river made for plenty of heart-pounding back and forth as well. It was made of bamboo or rattan with random weak spots and a perilous tilt toward the water below, but after only one hand-holding crossing C was ready to tackle it on her own. I think by the time I’d pitched the tent, B was starting to believe that I might be ok with camping, though I don’t think the full revelation came until the next morning when I made toast over the fire using a fish grilling basket. I suspect I’ll get to combine my love of shopping with my love of camping now because heaven knows we can’t be the only people on the continent of Australia in 2017 who are not fully kitted out for camping adventures. On our way back to Kinshasa we made a fascinating detour. Scattered throughout the country are various palaces and other monuments built by the DRC’s former military dictator, Mobuto Sese Seko. The most well known is Gbadolite, the town where Mobutu was born and where he built an elaborate series of palaces and, among other things, a runway large enough to accommodate the Concorde. Gbadolite is on the border with the Central African Republic and about 1,000 miles as the crow flies from Kinshasa, so we won’t be visiting there anytime soon. Much closer to home, however, is Mobutu’s Pagoda. The Pagoda was built in approximately 1971 as part of the Mobutu’s Presidential Domain at N’sele. Mohammed Ali allegedly stayed there when he came to Kinshasa to fight George Foreman in the Rumble in the Jungle. Mobutu was overthrown in 1997, but the Pagoda seems to have started its decline long before that. Now the only human inhabitants are the guards. Camp cots covered in mosquito netting are set out along the hallways with dented tin plates beside them, evidence of the thankless task of living in, and guarding, a ruin. The guards were friendly enough when we arrived, though did make it clear that, while they had no problems with us wandering around and taking pictures, it would cost us something to do so. I wish I could juxtapose the Pagoda now – overgrown with weeds, graffiti-covered and littered with beautiful pieces of the elaborate Chinese pottery that graced the roof, eves and columns – with the Pagoda when it was built, but I wasn’t able to find a single picture of the original structure online, so you’ll have to make do with pictures of its current state. The ghost of its former glory is there – in the paintings on every beam over the walkway surrounding what used to be a small lake – each one different from the next, and in the attention to detail evident on the carved columns and railings. We found a dumb-waiter as we were walking around and told the guard it was for food. He laughed. In one of the most destitute countries on earth its hard to do anything but laugh about a man who needed an elevator for his food when most of his subjects didn’t have anything to eat at all. The rains will be coming back again in about a month, so we’ve got a few more weeks to check off some more outdoor activities without worrying about getting wet. Of course, the flip side to avoiding rain is not being able to avoid dirt and sand, but dirty feet require pedicures, so it all works out fine for me. During the two years that I attended boarding school in Toronto, my parents lived only two hours away in a small town called London, Ontario. I went home almost every weekend, either taking a Greyhound bus or the train. I had nothing against the bus, it actually arrived in almost exactly the same time as the train (about 2 hours one way), but there was nothing magical about taking the bus. I got on, I sat down, I looked out the window and, about 2 hours later, I arrived. It was not perceptibly different than driving in a car except for a (usually disgusting) toilet in the back of the bus avoiding the need for highway rest stops. Nowadays there appear (though the windows I pass by as I haven’t actually been on a bus in many, many years) to be TVs and other entertaining accoutrement, but in the 70s I took a book with me, I sat down in my seat at the bus station in Toronto and I waited until the bus stopped in London. But there was – and is – something magical about taking the train. Something old school and other worldly and freeing. Can you imagine if Harry Potter took the bus to Hogwarts? Not the same image, right? I loved the train when I was in boarding school. I loved being independent enough that when I was 11 years old in my first year in boarding school I was allowed to take a taxi from school to the train station all by myself. That I was allowed to buy my ticket, find the gate and get on the train by myself and start my weekly journey home to my family. As a 40-something year old adult now, the idea of sending my 5 year old to take a train by herself in only 6 years is terrifying, but to my parents’ credit, they trusted me and believed that I could manage alone after taking my first voyage to the school with my mother (which was a doozy…). In the years since I left boarding school I have taken the train all over Europe and once or twice up and down the “Acela” corridor in the US (Boston – New York – Philadelphia – Washington DC) and it has never lost its magic for me. On a bus or in a car what you see is highway, but a train often puts you in the middle of a completely different landscape and allows a glimpse at a world that is perceptively different than the world you see from the road. It probably seems crazy to any American, Canadian or, certainly, any European, but you just do not see trains here and our whole group was abuzz. A few weeks later when we visited the very first locomotive in Congo during our Kinshasa tour, we found out that passenger trains had started running in late August meaning that the train you can just see the back of in the picture above was one of the first passenger trains to run on these tracks in almost 10 years. Well, not surprisingly to anyone who knows B or me, we immediately started discussing when, and whether, we could take the train in the Congo. Luckily for us, we have friends who have a similar sense of adventure as we do, and when they asked if we might be interested in joining them on a train trip we jumped at the chance. The train goes from Kinshasa to Matadi, the chief sea port in the D.R.C., but that trip takes 7 hours, leaving early on Saturday morning from Kinshasa, and returning early the next morning from Matadi. As we were planning to drag C and our friends’ two small children along with us, two days and 14 hours of traveling – even by train – seemed like a bit much. Luckily for us, one of the train’s five stops on its 7 hour journey is Kisantu-Inkisi, the location of the D.R.C.’s largest botanical gardens AND the Mbuela Lodge, a relatively “first world” resort. Bingo – a 2 1/2 hour train ride and a night at a nice resort. One of our friends went down to the “Gare Centrale” (or Central Station) to pick up the tickets, and then his wife and I followed along with our passports to register with the DGM (or Directeur Générale de Migration) who was sitting at a table under a tree beside the brand new train station. You cannot buy a round trip ticket, so we had to go to the station in Kisantu before the train’s scheduled arrival on Sunday to buy our return tickets. The tickets were not overly cheap (but nothing really is here), but they also weren’t overly expensive given the novelty and fun of getting to ride on a train in the Congo. A one-way ticket to Kisantu was $38 for the adults and $23 for the children over 4 (only C on our trip). So not too bad for a 2 1/2 hour trip which included breakfast on the way there, lunch on the way back, lots of A/C, a movie and amazing views of the Congo countryside. While the countryside was really lovely, the train took us far closer to the enormous slums and shantytowns that are scattered through, and on the outskirts of, Kinshasa. On the way back, I filmed several and, though it was raining, the extreme poverty is obvious and devastating to see, particularly as you sit on the luxury car of a train for a price that most Congolese don’t make in a month. Despite this, the children lined the path beside the tracks waiving and smiling and jumping up and down, proving the magic of trains for children everywhere. When we arrived in Kisantu we called the lodge and, in Congo time, they picked us up and ferried us back to their property. It took a little while to get our room ready (despite the “first world” appearance of the resort the booking and confirmation process leaves a little bit to be desired and a lot of people we’ve talked to have told us that “losing” reservations is commonplace), but eventually they did find us somewhere to sleep. Kisantu is also home to a 7,000 acres Botanical Gardens that are, somewhat surprisingly, quite lovely. Clearly the people in charge have not let the lack of money, and the myriad of other problems the D.R.C. has experienced over the years, dull their enthusiasm for keeping the Gardens in relatively good condition. There were also two crocodiles – one huge and one tiny – and a baboon as the last vestiges of a by-gone zoo. Mbuela Lodge is nice, and not nearly as expensive as Zongo was, so we definitely enjoyed hanging out there by the pool, playing mini-golf and having a nice meal (though it was also brought to us in “Congo time.”) There was a great indoor play area for kids, as well as four-wheelers you could rent, and a stable with quite nice horses that you could ride for a fee. C got on her first horse (v. pony) and looked like enough of a natural up there that we may have to take her to the local riding stables now that she is five. Oh yeah, C turned five in Congo! We had a great “Princess Unicorn” party the weekend after our train trip complete with Princess bouncy house, a unicorn cake, a crown cake and a rainbow king cake, all made by me (yes, I was channelling my inner SAHM). Unfortunately, soon after the kids came inside for a lunch break the skies opened and the “Rainy Season” lived up to its name for the next six hours short circuiting the bouncing and outdoor play but, luckily, not dulling the high spirits of the birthday girl. At the end of this week we head out on our first “R&R” – the required time we have to take to leave the D.R.C. and experience some “first world” living for a few weeks. Over our two year tour we get to take two “R&R’s” and this is our first one. We are headed to visit B’s family in Florida, including a two day trip to Disney (heaven help us – in the middle of Spring Break/Easter…), a visit from B’s grandmother from Minnesota, and a three day get-away for B and me with a bunch of our Charlotte friends. We are VERY excited, though even with three weeks we don’t have time to see and visit half of the people we’d like to see, so our excitement is tempered with some disappointments. It’s going to be a wonderful, but bizarre three weeks as we walk and drive freely wherever we want, drink Starbucks to our hearts content, and play in the wide open green spaces available to us. But as wonderful as it will be (and I know it will) I also know we will be excited to come back to Kinshasa, to our home, to Miller and to the next adventure that awaits us here. Congo is, with very (very) few exceptions a cash society. You do occasionally see a sign for Visa or Mastercard, but I have, quite literally, not seen a single person actually use a credit card to purchase anything in a store since we got here over six months ago. For me it has been a bizarre adjustment since, in the U.S., I used a credit card for everything and almost never had any cash on hand. B has been playing the points “game” for a couple of years now, figuring out which cards have the best bonuses, which airlines have the best programs and how we can parlay that into free flights, hotels and trips. The result is that we paid for everything in the U.S., from a cup of tea to my taxes using a credit card. Which card to use, when to use it and how much to use it was dictated primarily by the point bonuses and calculations of the various cards. Now here we are, in a cash society, with a pile of credit cards going unused in our safe. When we pay for things (read: Amazon) over the internet in the U.S. using a credit card we only use one (and for the record that is our Chase Sapphire – no foreign transaction fees and best availability for point use of any other card we’ve found). Although I haven’t really counted precisely, I think we estimated that we have well over $250,000 in credit between us – all available if we decided to go on a crazy spending spree. A lot of people were aghast at our “collection” of cards and warned me that it would affect my credit score – and it has. Before we started our points crusade I had a good credit score, but now, with dozens of credit cards to my name and thousands of dollars available to me, my credit score is…perfect. What? Yes. Perfect. 850. Keep in mind here that I no longer have a job. No money is regularly coming into my bank account. I’ve been watching my score climb steadily over the last year and it has left me both amused and flabbergasted. As a society, Americans are incredibly reliant on these scores. They determine the rate at which we can get credit through the bank – for mortgages, cars, business loans etc. They also determine what additional credit you can get in the way of credit cards. So, how does it make sense that I have no job and dozens of credit cards and my score has gone from the mid-700s to 850?! Meanwhile, when I go grocery shopping in Kinshasa I have to make sure I bring cash with me. We have to remember to cash checks at the Embassy so that we have enough money to go out to dinner, buy gas, buy groceries, and pay our staff. When we went to Zongo in September we paid for our room in cash. I paid for C’s school fees in cash. Last month I bought a TV with cash – handed over the bills and, in return, received a television. 1800 CF = about $1.94 U.S.
It’s not just any cash either – it’s American dollars, with a few Congolese francs thrown in as change. I have no idea why the Congo is “dollarized.” As a former Belgian colony you would expect them to use Euros, but, luckily for us, they use the U.S. dollar and that is what we regularly hand over in stores. Except, oddly, they will not literally accept a dollar. The Congolese stores (for the most part) don’t accept dollar bills. I, again, have no idea why, but there it is. No dollar bills. The smallest bill they will accept is a $5. When you hand over your American money to cashiers, they will examine it carefully and, if it has a tear (even a tiny one) or a mark any bigger than about a 1/4 inch, they will hand it back to you and refuse to accept it. 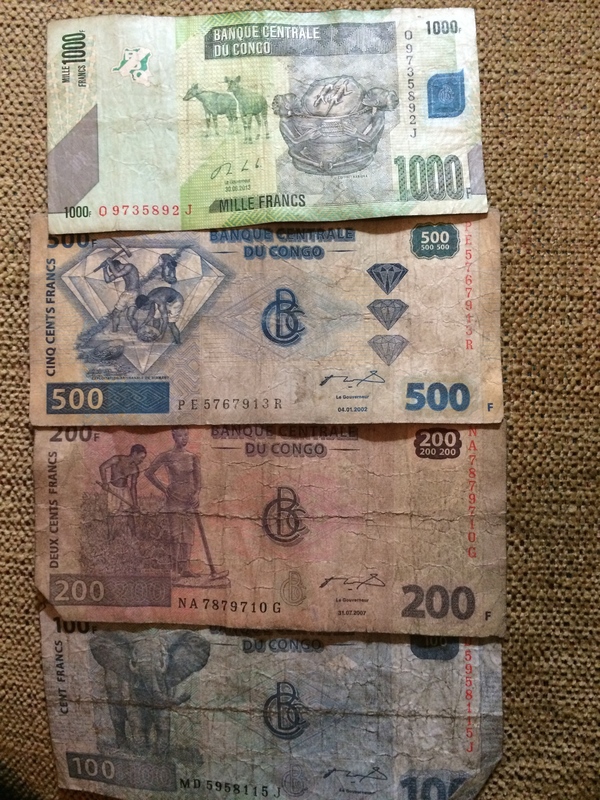 Meanwhile, the Congolese francs are filthy, ragged pieces of paper that, occasionally, are so difficult to read you don’t know if you have a 500 CF bill or a 100 CF bill (which are both blue), but they will accept them no matter what condition they are in. There are no coins here, probably because the CF is worth so little ($1 = approx. 928 CF) that the smallest bill, 50 CF, is equivalent to $0.05, so why bother with coins for amounts smaller than that. I don’t know if that is a correct assumption, but the fact is that our wallets are filled with bills – lots and lots of CF equaling a lot less US – but they remain light. This is in contrast the the UK, EU and Canada where they’ve gone the opposite direction and switched their smaller bills into coins providing everyone with a free weight workout whether they like it or not. Money is also treated with more respect here. When I pay my staff they always take their wages with two hands and press their hands to their hearts in thanks to me as they accept it. In the store I never see Congolese shoppers just shove their change back into their purse (the way I often do), and when C leaves money from her piggy bank on her bed or dresser (because she likes to play with it…go figure), Romani, our housekeeper, always folds up the bills and puts the coins in a pile. It’s a respect and appreciation for even the smallest amounts that we can’t seem to muster for anything less than a $50 bill (and sometimes not even that). Maybe its about the visible and the invisible in the two societies. In the U.S., for the most part (and certainly for most people I know), money is invisible. It flows electronically – between banks, through credit card machines, on checks. We rarely, if ever, use cash in the U.S. anymore. With services like Uber and Urbansitter (basically Uber for babysitting) not only do you not pay in cash anymore, the money just automatically comes out of your linked credit card without you ever really seeing it. Maybe that is where the respect comes from too. Cash for most Congolese is the key to acceptable food, shelter, medicine, education and work. Change is never “spare.” It is vital and necessary every day for every part of their lives. For us cash is what we get out of the ATM for “extras” – to have just in case we need it. If there is an emergency we have bank accounts, credit cards, and multiple ways and means to access funds. That is mostly unheard of and unknown here – very few people have any savings beyond a few hundred dollars, so without cash here you have nothing. It breeds a different feeling for the money we use by making it more visible to us. We are aware what we are spending and how much things cost because we see it and feel it physically – not just as numbers on a machine which appear and disappear magically with the swipe of a card. I am much more conscious of what I’m spending because I am actually spending it – handing it over to someone else in exchange for a good or service. My hope is that the reality of having to hand over cash at every turn will make me more conscious of what I’m buying, and what I’m spending. Don’t get me wrong, I don’t expect it to cure me of being a “shopper” down to my very core (yes, I can even happily spend hours browsing at the grocery store – going in and grabbing what I need and leaving seems almost criminal to me). What I hope is that, like many things in the Congo, it makes me more aware and thankful for what I have, and what others do not have. There are so many ways in which the reality of money is brought home to us that it is hard to find just one. The Congolese street child who asks for 500 CF – about $0.50, saying “je suis faim”(I am hungry) just before we go out to dinner and pay $150 US dollars for our food – about 140,000 CF. The time I was helping Papy, who has three children and a wife who doesn’t work outside the home, fill out a job application and had to write down that his yearly salary is $4,200 – and he is relatively well paid here. The guilt I feel when our staff asks for loans or advances on salary and I feel annoyed that they seem to see us as a bank. The reality of what money means here is daily lesson and it can be devastating in ways that are hard to accept. But, in true “money can’t buy happiness” fashion, most Congolese people smile easily, they laugh and enjoy what they do have in ways I’m sure some of the people I knew in my former life cannot ever appreciate their newest car, house or other material possession. If nothing else, I hope that C will learn to respect and appreciate every dollar that flows through her hands and to understand that she is lucky beyond any monetary measurment simply by virtue of when, where and to whom she was born. Sigh. What happened is life in Kinshasa. I feel like I am always running to catch up these days. I actually have three half (or almost fully) written posts that glare at me accusingly when I log onto the blog, but I can’t seem to find the time (or maybe muster up the effort) to get them finished, get photos uploaded and get them posted. Or, when I sit down to get them finished it has been long enough since I started writing that the timing is all off. This all started in the fall when I started working on Christmas presents. I finally started sewing, but I couldn’t really blog about it because everything I was sewing was going to be sent stateside as a present, so I couldn’t show any pictures without ruining the surprise. Since I was also sewing like a crazy person I was also not writing about anything else, and so it began, the slow decline into a monthly blog post instead of a weekly one. It’s been a week of firsts for me in the Congo: first boat trip up the Congo River to lounge on a sandbar, first trip to the “Marble Palace” to see where Laurent Kabila was assassinated, and my first car accident. It really was very bland as accidents go. I was driving down the road toward the embassy and a pick up truck backed out of a roadside parking space and hit me. We’ve been taught not to stay at the scene of an accident in Kinshasa if we can help it. Instead, we make our way immediately to one of the “safe” locations for US diplomats. For me, the embassy was very close by, so I just kept moving. A man ran up to the window and started shouting “arrête, arrête!” but I ignored him. It didn’t actually sound that bad when it happened; it certainly looked worse than it sounded when I finally laid eyes on the damage. Once I got to the embassy and got out of the car I could see that the back panel of the car had been ripped off, so maybe he was just trying to get me to stop so I could pick up the piece of my car that was apparently lying in the road, but then again, maybe not. Americans = rich in Kinshasa, so even when an American driver is not at fault in an accident (as in my case) a crowd can gather quickly and tensions can escalate. We even have special cards made up that explain in French and Lingala that we will not leave the car, we will be driving away and if the person needs to contact someone about the accident they should reach out to the embassy. I didn’t even bother with the card given the circumstances of my accident, I just kept on going. The embassy guards and I drove back over to the area in their truck about 20 minutes later, but the pieces were long gone. In other words, “for the street children (called Chegues here (pronounced shay-geys)) nothing is impossible.” One of the drivers in our compound has even suggested that if we take the car somewhere local to have it fixed we may find that we get our own part back – at a price of course. I’m just glad that the damage wasn’t worse and that no one was hurt in either car. Fingers crossed that is my first AND last accident here. The next weekend was a four-day weekend for Americans in Kinshasa as Friday was a Congolese holiday (Heroes Day) and Monday was MLK. Heroes Day is really two days. One in honor of Patrice Lumumba, the first prime minister after the end of colonialism in 1960 who was assassinated on January 17, 1961, and the other in honor of Laurent Kabilia, who was President of the DRC after overthrowing the military dictator Mobutu Sese Seko. Kabilia was the father of the current president, Joseph Kabilia, so he is often referred to here as “Papa Kabilia.” He was assassinated on January 16, 2001. Every year on January 16 the DRC government opens the so-called “Marble Palace” where Papa Kabila was assassinated to the public. The room in which he was shot has (allegedly) not been touched since that time and you can still see bullet holes in the chair he was sitting in. We decided it was worth the wait to see the palace, though it is not much of a palace and I’m not sure what (if anything) was made of marble. Either way it was interesting and I’m glad we checked it off our list, but we won’t be going back again next year, so that’ll be a first and last for me as well. The only first that I hope gets repeated at regular intervals was the amazing trip up the Congo River. This was our first “sandbar” outing as well as our first time on the river proper. Typically (apparently) you are only on the river for 20-30 minutes before a suitable sandbar is found for lounging. However, there has been so much rain lately that it took us almost an hour and a half to find a sandbar big enough to accommodate the 25+ of us who went out on the trip. The ride was worth it – and was amazing and beautiful in and of itself. Once on the sandbar, tents and tables were set up and the boat crew set up a grill and cooked the meat and other food we brought with us. We drank beer and ate hot dogs while the children played in the sand and the shallow water. I took my first official “swim” (more like drifting in the current) in the Congo River and if I could go back again this morning I’d be on my way. Instead, we’re enjoying another lazy Saturday morning. C is coloring, B is watching football (“soccer” to the Americans) and I am FINALLY finishing a blog post. Certainly not our first Saturday morning like this, and I have no doubt we’ll enjoy many more such mornings while we plan the next “first” in our Congo adventure.